The Juno spacecraft passed over the giant storm on Monday as it continued with its series of close passes of the gaseous world. The pictures of the spot reveal the intricate nature of its swirls which encompass a region bigger than Earth. Juno's instruments all acquired data during the pass which should now provide fresh insight on the storm. It has been a particularly long-lived feature on Jupiter, but there is evidence that the 16,350-km-wide oval has actually been shrinking of late. "For hundreds of years scientists have been observing, wondering and theorising about Jupiter's Great Red Spot," Scott Bolton, Juno principal investigator from the Southwest Research Institute in San Antonio, said in a Nasa statement. "Now we have the best pictures ever of this iconic storm. It will take us some time to analyse all the data from not only JunoCam, but Juno’s eight science instruments, to shed some new light on the past, present and future of the Great Red Spot." Scientists describe the storm as something similar to a hurricane - but there are significant differences between that kind of storm on Earth and what we see at Jupiter. Many behaviours are not the same. For example, hurricanes on Earth quickly lose energy when they leave the ocean surface and pass over land - but on Jupiter, there is no land. Indeed, researchers are not even sure there exists any kind of hard surface under the planet's clouds. This could be an explanation for why the spot has persisted for centuries. But Juno hopes to resolve such puzzles. It has the instrumentation to determine the precise chemical composition of the oval's clouds, to sense their temperature and structure, and to measure how deep they go. There is a suspicion that the spot has very deep roots. Jonathan Nichols, a British science team-member from the University of Leicester, marvelled at the new pictures. 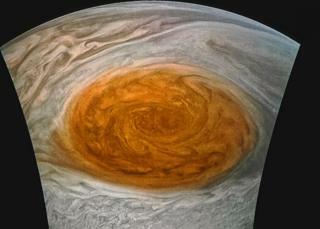 "These images are stunning, and reveal Jupiter's Great Red Spot in all its glory," he told BBC News. "From the three swirls inside the deep red core to the waves and vortices orbiting it, the images reveal the power and chaos of this iconic storm. "The light and dark shades reveal the wind flow in the spot and potentially the 3D structure of the cloud decks. But the images are also a perfect convergence of science and art, revealing the awesome beauty of the giant planet. "The quality of these data are superb, and it bodes well for further Juno data that will reveal how deep into the atmosphere the Great Red Spot extends." Juno has been at Jupiter for just over a year. It flies large ellipses around the planet, coming in close every 53 days. Monday’s pass saw it skim just 3,500km above the cloudtops at one point. When it travelled across the spot, it was still a mere 9,000km overhead. The practice of the mission so far has been to release raw images from JunoCam and invite the public to work on them - to process them in ways that highlight areas of scientific interest, or simply to make some fascinating artwork. Meanwhile, the science team gets to work on the data-sets from the other instruments. Their findings take a while longer to emerge - at conferences and in journal papers.